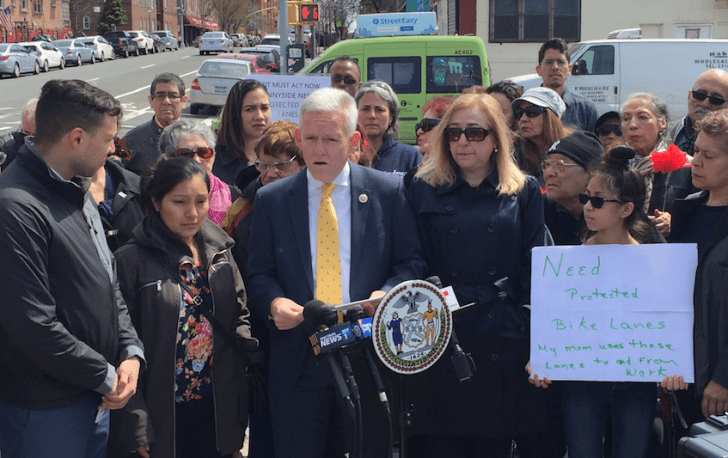 Council Member Jimmy Van Bramer says he “regrets” his role in the painful community process that ended up creating the soon-to-be-built protected bike lanes on 43rd Avenue and Skillman Avenue in Sunnyside. Van Bramer’s public admission of remorse — made at a Department of Transportation press conference on the unrelated topic of speed cameras — may redeem him to street safety advocates but will likely further enrage opponents of the bike lanes, who rallied against the city plan again on Wednesday night. Van Bramer declined to tell Streetsblog his full list of regrets, so we decided to review the year-plus timeline of the creation of the Sunnyside protected lanes to recall all the things that Van Bramer should regret. First, some background. Van Bramer did indeed please street safety advocates when he called for a protected bike lane on 43rd Avenue in Sunnyside days after the April, 2017, death of delivery cyclist Gelacio Reyes. The Department of Transportation came back seven months later with a plan for twin protected bike lanes — one on the eastbound 43rd Avenue and one on the westbound Skillman Avenue. Quickly, the PTA at P.S. 11 raised an objection, claiming without evidence that the protected bike lanes would endanger children. Later, Community Board 2 fought the proposal, citing the loss of free car storage for the neighborhood’s car-driving minority. That’s when Van Bramer really started adding up regrets. Regret 1: Why, o why, didn’t I push back against the PTA when its leaders misled the public? And why did I agree when Community Board 2 said that the loss of a few dozen places for selfish residents to store their vehicles for free is more important than safety? He asked for, and got, two tweaks from the DOT, but still would not come out in favor of the plan. Then, he allowed a March, 2018, town hall to turn into a lie-filled anti-bike free-for-all. “Protected bike lanes do not guarantee safer streets,” business owner and then-Van Bramer supporter Gary O’Neill said at the hearing, but Van Bramer never pushed back with the truth: Protected bike lanes do guarantee safer streets. And there is also no evidence beyond the anecdotal whining of a few merchants that removing parking spaces hurts businesses. City stats show just the opposite. Regret 2: Why, o why, did I endorse now-fired Congressman Joe Crowley? Just before Community Board 2 voted against the city plan, Queens machine leader Joe Crowley took the extraordinary step (for a federal official) and weighed in against a bike lane of mere blocks in his otherwise sprawling district. That put the supposed progressive Democrat Van Bramer in a corner because had already endorsed his political patron Crowley over Alexandria Ocasio-Cortez, who challenged, and defeated, Crowley in the Democratic primary in June. After the primary, Van Bramer gushed over Ocasio — not a good look for a guy who backed the machine against the very politician he claims he is. “Her victory was powerful and inspiring,” he said of the woman he declined to initially support. Regret 3: Why, o why, did I let Community Board 2 Chairwoman Denise Keehan-Smith be the public face of my Hamlet routine over the lanes? Any self-professed bike lane supporter should have pushed back when Keehan-Smith told DOT, “I don’t want people dying … but you’re really gnawing away at the fabric of the neighborhood.” A few parking spaces get turned into safer streets and the neighborhood is frayed — but residents dying in unnecessary crashes somehow repairs the local fabric? Where was Van Bramer in these moments? Adding to his pile of regrets, no doubt. Regret 4: Why, o why, didn’t I at least support the proposal after the CB2 Transportation Committee voted in favor of it? Regret 5: Why, o why, did I put out a statement after the vote that tried to please everyone, but ended up pleasing no one? “I have been remarkably consistent,” Van Bramer said on Wednesday, claiming that all of his public statements expressed his support for protected bike lanes in general. But he wasn’t fully consistent. I agree! After the tragedy, I called for protected bike lanes and traffic calming measures here. We've got to keep fighting for this. “Do I regret that? I do,” he said. What I want to know is what part Van Bremer’s husband (Don’t You Know I am) played in all this and if he reieved any money from the city in any way what so ever and if so, why wasnt a conflict of interest raised? Bikers are a menace ! The council member provides a rare glimpse into his public and private anguish.